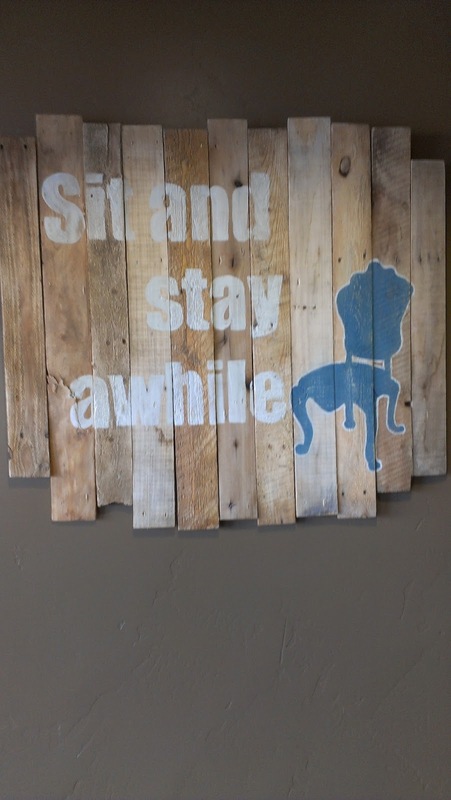 One of the things I love in Provo is its unique restaurant scene. 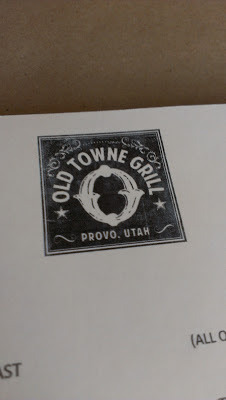 There are hidden gems downtown and beyond, and my newest favorite find is Old Towne Grill (295 West Center Street). Located inside The Madison, Old Towne Grill offers a comfortable dining experience in a really cool space. The building is actually a three-story club (dancing!). It's a fun discovery around every corner in there. 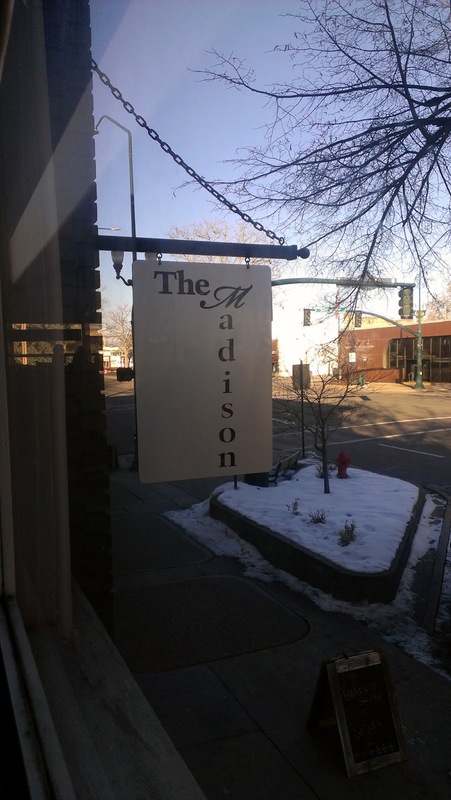 Business partners Adam and Josh have prioritized using local, organic, and sustainable products wherever possible. This of course means that prices are reasonable and the food is delicious. 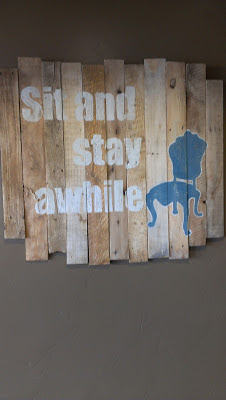 And I find the wall art, and mismatched and presumably repurposed dishes and to be a charming touch. They serve lunch and dinner, and on Saturdays they serve breakfast. I recently took my family there for breakfast, and we really enjoyed it. 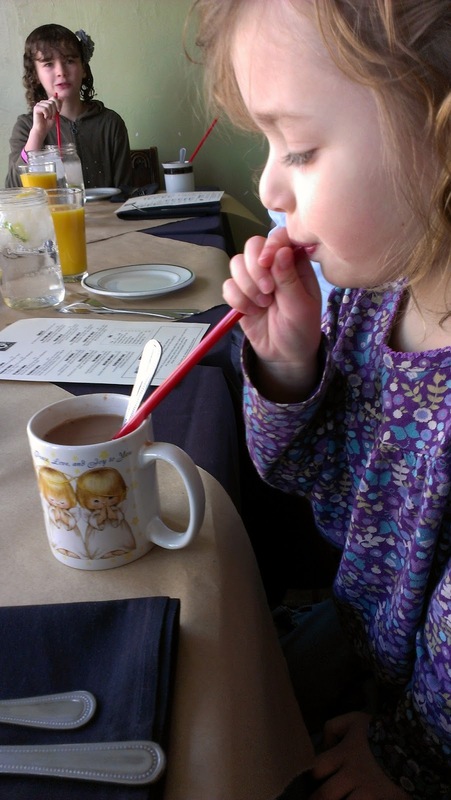 The kids' only complaint was that there was no chocolate milk on the menu. My littlest one still enjoyed her cocoa just the way she likes it: with a straw. 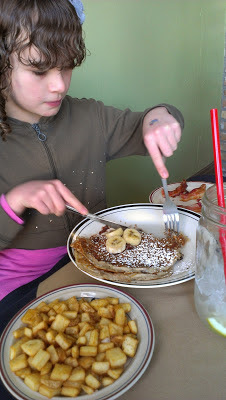 My family really liked the chocolate chip pancakes (with or without bananas). I loved the omelet I had. We were all fans of the breakfast potatoes, and let me tell you a little secret: you like-a the spice? 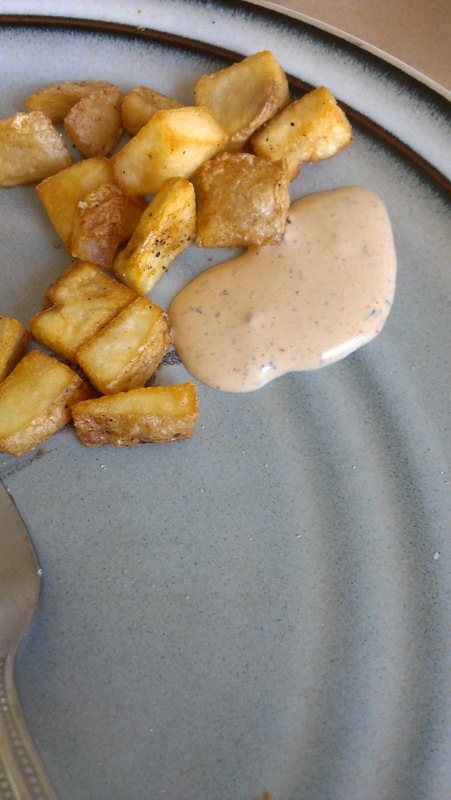 Ask for a side of Madison Sauce, which you will use for dipping your hash browns. YOU'RE WELCOME. 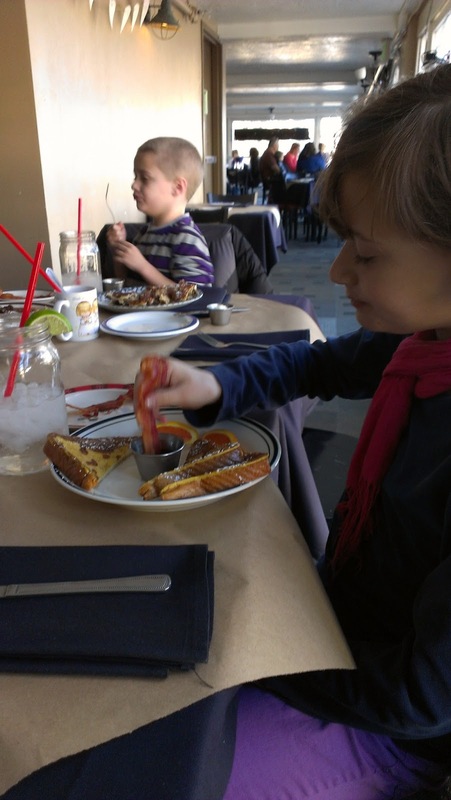 Or, just act like my 8YO and dip your bacon in syrup, we don't judge. 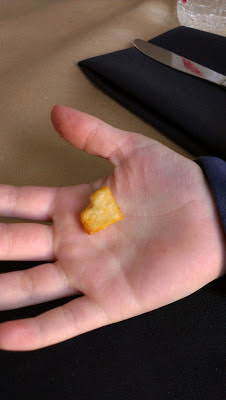 And speaking of the hash browns, one of my kids found a valentine. 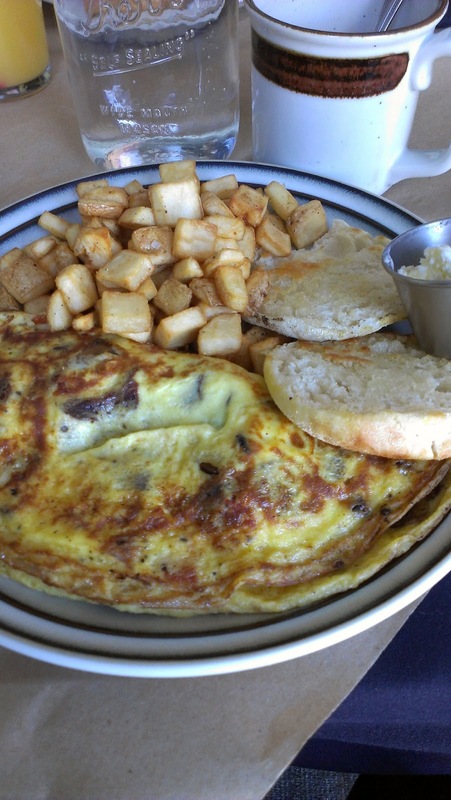 Wouldn't you love to try Old Towne Grill's breakfast? You know it would be the perfect thing following your Saturday morning run. Let me know if I should meet you there. To enter the giveaway for Breakfast for 2 at Old Towne Gill in Provo, just follow the directions on the Rafflecopter widget you see below. 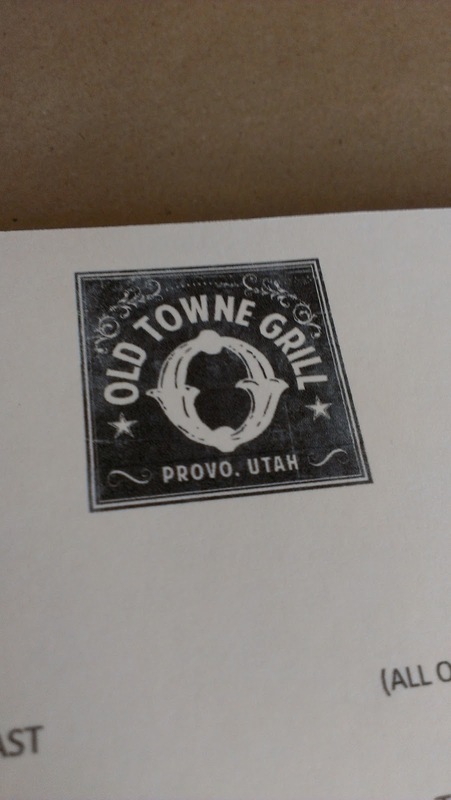 Thank you, Old Towne Grill! Hot Chocolate, bacon, and an omelet! 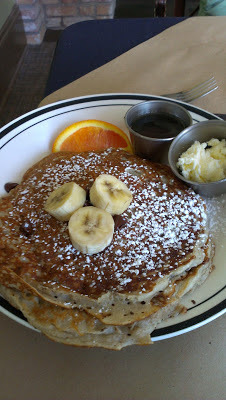 I love Old Towne Grill, but haven't been there for breakfast yet. Ideal weekend breakfast is a hard one...so many good choices, but probably a big fluffy waffle with fruit & whipped cream, but also a side of buttermilk syrup plus hash browns & a really good sausage & freshly-squeezed orange juice plus a mug of hot cocoa with whipped cream. Mmmm. I love french toast or waffles with berries and cream. Yum! And breakfast is even better if I didn't have to make it. French toast with real whipped cream or an omelette that at least has cheese and mushrooms in it. Also, bacon. And sometimes chocolate cake. Definitely French Toast and orange juice! Hmm...we usually eat pancakes on saturday because I'm too lazy to make waffles...I've eaten dinner at old towne once, but never tried their breakfast. It sure looks good though! Homemade cinnamon rolls-or anything you posted about-yum! I think my favorite breakfast is french toast!! My favorite breakfast has changed since surgery, because anything super carby like waffles makes me sick. But I love me a good scramble with lots of cheese, sausage, and veggies. In lieu, croissants and a hot drink. I love to make scones (like the kind from England) with hashbrowns, sausage and eggs. Mmm I love my hash browns. And I never pass up a Southern breakfast with grits and biscuits and gravy! We tried the Old Towne Grill for dinner just a few weeks ago, and we are so excited they do saturday morning breakfasts! I'm a sucker for a good omlet. I'm no good at making them at home, so I get them when I can out and about! Something sweet and something savory! I live for peach crepes, and breakfast potatoes are my fave when they are done right!